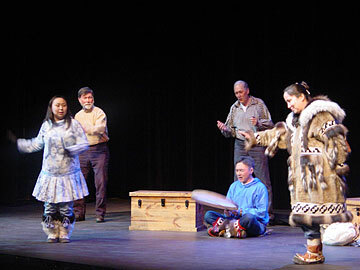 Members of the Alaska Native Heritage Center and Inupiat Heritage Center share their culture with people of Hawaii and Massachusetts during the annual Mary Kawena Pukui Festival of Performing Arts. The three cultures share a rich seafaring and storytelling tradition. 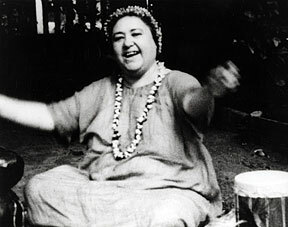 Although she died 20 years ago, Mary Kawena Pukui -- cultural expert, translator, genealogist, kumu hula, author, teacher, researcher, storyteller -- still ranks among the most beloved and respected of all Hawaiian scholars. Admission: $14.95 per person, $11.95 for ages 4 through 12, free for Bishop Museum members and kids 3 and under. Kamaaina 4 and older pay $3. 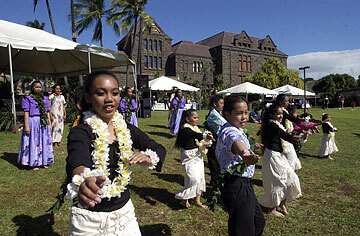 Attendees will enjoy songs, dances, music and lore presented by 25 gifted native Hawaiians, American Indians and Alaskan Natives; plus the museum's exhibits; food (chili, mochi, shave ice and more); and rides and games including a rock wall, Wave of Lava Slide and pineapple tubs (similar to Disneyland's fanciful twirling teacups). A child of two different worlds, Pukui was born in the rural district of Kau on the island of Hawaii in April 1895 to a Hawaiian mother and Caucasian father who hailed from Salem, Mass. She lived, until she was 6, with her maternal grandmother who taught her the Hawaiian language and numerous chants, dances and legends. As Pukui's knowledge grew, so did her love, pride and interest in her Hawaiian heritage. After her grandmother's death, she returned to her parents' home, where she assimilated both Hawaiian and Western ways. Her mother spoke to her only in Hawaiian; her father, only in English. In her teens, Pukui began collecting Hawaiian sayings and stories shared by friends and family members. With the influx of foreigners, including immigrants arriving en masse to work on the sugar plantations, Pukui was afraid her precious cultural traditions would be lost. She began taking detailed notes that provided the framework for the more than 50 books and 150 songs she would eventually write. For more than half a century, Pukui worked at Bishop Museum, where thick files of chant texts, oral-history recordings and ethnographic data based on her research and fieldwork are now preserved. Her lifelong passion for na mea Hawaii, "things Hawaiian," was marked by a commitment to remain true to the knowledge she had been privileged to receive. She was meticulous when she retold and recorded moolelo (stories), never taking creative license. "Some people heard stories and then rewrote them in a Western sense," says Pukui's hanai (adopted) daughter, Patience Namakauahoaokawena Wiggin Bacon. "As a result, a lot was lost. That was not my mother's style. She always said, 'I'm speaking from my own doorway and not anybody else's.' You speak only of things that you know. You don't take from elsewhere." The festival is named for Mary Kawena Pukui, shown here in 1930. THE ANNUAL Mary Kawena Pukui Storytelling Festival was founded in 2001 to pay tribute to Pukui's rich legacy and love of Hawaiian culture, language and lore. It is presented by Education through Cultural and Historical Organizations through a partnership with the Bishop Museum, the Alaska Native Heritage Center and Inupiat Heritage Center in Alaska, and the Peabody Essex Museum and New Bedford Whaling Museum in Massachusetts. Established by Congress, ECHO is a federally funded initiative that serves thousands of children, teachers and adult continuing-education students in those three states. Its programs provide participants with educational benefits, cultural exchange opportunities and a greater appreciation of local and national history. The festival's original format revolved around storytelling by the native Hawaiians, American Indians and Alaskan Natives. "Each of the five organizations would present stories about their culture, then they would come together to produce a collaborative piece that tied all of the cultures together with a common thread," said project manager Noelle Kahanu. Over the years, singing, dancing and movement were added to the storytelling component, which led to the renaming of the event to the "Mary Kawena Pukui Festival of Performing Arts" this year. Also, participants outside the original five have gotten involved. Last year's festival spotlighted authors of works published by Bishop Museum Press and students from Halau Lokahi and Hakipuu Learning Center, two Oahu charter schools closely tied to Bishop Museum. Independent from the state's public school system, these schools offer a curriculum with a strong Hawaiian cultural foundation. On Feb. 19, native Hawaiian artist Solomon Enos will oversee the creation of a 50-square-foot mural telling about Mooinanea, the great lizard goddess who resided in Waolani near Alewa Heights. After Enos sketches the story on canvas, festival-goers can pick up brushes to help bring the mural to life. Honolulu's Tau Dance Theatre has also been invited to coordinate the collaborative piece focused on each group's creation stories. "Past presentations have featured each culture and their stories separately, in a fairly traditional oral setting and delivery," Kahanu said. "With the help of Tau Dance Theatre, the aim this year is to incorporate dance and movement to tell a more vivid story. We hope this new approach will significantly improve the quality and interactive element as the audience will be encouraged to dance, move and sing along with the performers." PRIOR TO THE festival, the collaborative piece will be presented to students at Anuenue, Castle High, and Waimanalo, Nanaikapono and Nanakuli elementary schools. Following the festival, it will also be staged at schools and public venues in Alaska and Massachusetts. According to Kahanu, these events offer attendees a valuable glimpse of three native cultures that are alike despite their physical distance. She recalls dramatic presentations by the Hawaiians, the Wampanoag tribe of Gay Head, Mass., and Alaskan Natives from Sitka during the festival's second year. Dancers of the Na Pua Mai Ka Lani halau performed at last year's Mary Kawena Pukui Festival of Performing Arts at Bishop Museum. "We realized that these stories came from island people from three states that couldn't be farther apart, and yet they shared the same connection to the sea, the currents and the stars," she says. "What was striking were our similarities rather than our differences, commonalities that transcended time and distance." As the festival enters its sixth year, Kahanu notes, "We have found that it is as much about building relationships among people, artists, institutions and communities as it is about cultural education. Last year, one Hawaii performer, Hiilani Shibata, made a kahili (feather standard) on behalf of Bishop Museum to present to the Wampanoag tribe. Their leader was speechless, so moved was he by the honor bestowed and the depth of the relationships formed." The Mary Pukui Festival has shown that the enduring bonds of brotherhood can be forged with the sharing of just one song, one story. "It is an honor to be able to welcome our native partners from afar, to host them in our state and to share their stories with thousands of schoolchildren and families," Kahanu says. "It is also an honor to travel across the country, sharing the stories of our Hawaiian people, to delight students with oli (chants), mele (songs) and hula and to remind ourselves that we are all really one family, 'na mamo o na kamahele e au i ke kai loa,' descendants of those who traveled the wide expanse of the sea."